Can you feel the crisp in the air? Ahh, the wonderful anticipation of cool nights, warm days, and the rich earthy smell of autumn as nature bursts into flaming fall colors. What a wonderful season to explore and enjoy nature! This fall I am looking forward to shooting the transition to autumn along the East coast with one of the highlights being the Fall workshop I am leading in the West Virginia Highlands region (see more about this below). The past summer has also been wonderful with a return trip to Glacier National Park in Montana along with Banff in the Canadian Rockies. 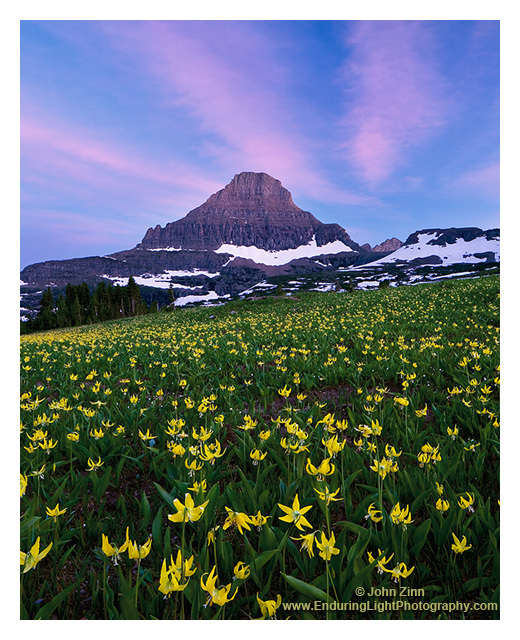 This photograph titled "Mt Reynolds Sunset" captures some beautiful late sunset light and a carpet of fresh Glacier lillies at Logan's Pass just off of the Going-to-the-Sun Road in Glacier. In the next few weeks I will be updating my online gallery with new images from the Tetons, from Glacier and Banff, and from the waterfalls of Rickett's Glen in Eastern Pennsylvania, so stay tuned. Learn from a pro and take your photography to the next level! My next Nature Photography Workshop will be held on Oct 8-9 in West Virginia around the Canaan Valley and Dolly Sods region. Each workshop is customized to the needs of the attendees and covers elements of compostion, digital camera settings, and image post-processing. The 2010 workshop schedule is now online, and individual instruction is also available.